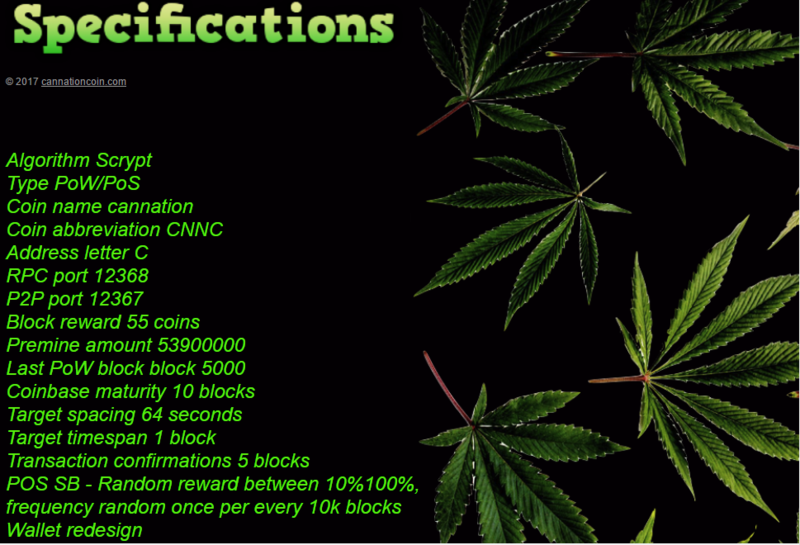 - 99% of the coins will be distributed to early supporters in ICO procedure to participating users based on their contribution in the total amount of the raised funds for Cannation Development . .▬▬YOUR CONNECTION TO EVERYTHING CRYPTO▬▬. .FRIENDLY COMMUNITY▨REAL-TIME CHAT▨QUICK HELP▨VERIFIED COIN DEVS. CNN ICO will be placed at exchange to be announced, there is a bonus for early buyers, until CNN get added to exchange for crowdsale. The 40% wall at exchange after ICO is a good idea. What market are you targeting? Because I can assure you that no cannabis dispensary in the United States is going to accept your crypto as a form of payment. The regulations in the various states that have legalized Marijuana are pretty strict. I doubt any dispensary will ever accept anything other than a well established cryptocurrency like bitcoin if they ever accept any. No dispensary in the United States is going to risk running afoul of current regulations especially with the threat of the federal government stepping in. Marijuana is still a schedule 1 drug in the United States per federal law. I am very skeptical of your motives. This looks like just another attempt to take btc from peoples wallets and put it in yours. I regularly visit legal marijuana dispensaries in the United States. I can assure you that none of them will ever accept this coin as payment. Have u negotiated this with CNN? It came as no surprise to me that u have worked for CNN since u were born. They should know u and what ur capabilities are since u were their emplyee but unlikely they know that u are once again breaking copy right laws. Unbelievable. I already reported u to the police and will encourage others to do the same, to give u the last life lesson before u go to jail. We are going to change ticker and update source,brb. look forward to mining some also! This smells heavily of the developer of Marijuanacoin Prizzrak who recently just stole 18 BTC from the community. If your going to invest your money into an ICO make sure to use a qualified and reputable escrow partner in order to make sure your funds are safe from theft. And before you throw any money in you need to ask yourself, why would this require an ICO? Why are the people responding in this thread pumping it Jr. members with no post count and why is the dev launching an ICO with a brand new fresh account.